Head out for Opening Day at these exciting games and sports events around Houston in April 2019. This month gets rolling with three season openers for Houston teams, one squad beginning their playoff run, new stadiums, and a couple tournaments to boot. 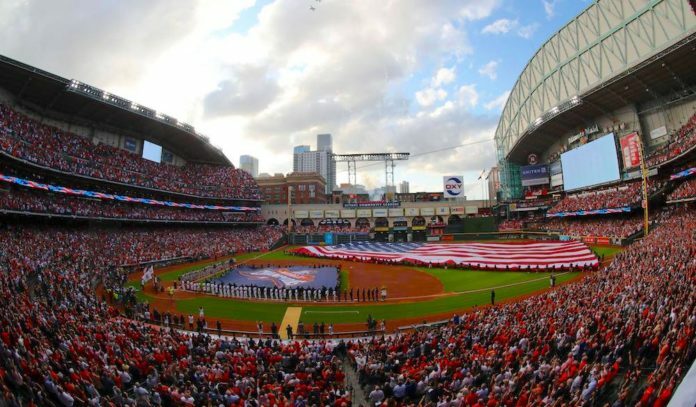 Houston Astros vs. Oakland Athletics at Minute Maid Park | Friday, April 5 – It’s a new year and, after falling to the eventual World Series champions from Boston, the Astros aim to #TakeItBack. Opening Day kicks off with a Street Fest outside the ballpark with live music, games, food trucks, face painters, and inflatable fun. Standing Room-Only tickets are $49, with seats ranging from $63 to over $200, but you may find better, cheaper, or hard-to-get seats using the TicketNetwork online marketplace. 7:10pm. Houston Rockets vs. Phoenix Suns at Toyota Center | Sunday, April 7 – It’s Fan Appreciation Night for the final home regular season game before the Rockets embark on a deep playoff run. Attendees will have a chance at catching autographed memorabilia and seeing special in-game entertainment. This will likely be the cheapest remaining game before the playoff push, too. Tickets range from $20 to over $500, but you may find better, cheaper, or hard-to-get seats using the TicketNetwork resale market. 6pm. Houston Astros vs. New York Yankees at Minute Maid Park | Tuesday, April 9 – A budding rivalry, these elite American League teams have had some spicy face-to-face encounters over the past couple seasons and now they renew their fight for conference control with this mid-week matchup — on Dollar Hot Dog Night, no less. Tickets range from $25 to over $125, but you may find better, cheaper, or hard-to-get seats using the TicketNetwork online marketplace. 7:10pm. NHRA Spring Nationals at Houston Raceway Park | Friday, April 12 through Sunday, April 14 – Grab your earplugs and head to Baytown for a weekend of drag racing featuring high-octane motorcycles, mod, and nitro competitions. Single-day tickets start at $35 for adults; $5 for children, with multi-day packages available from $115. Times vary. Houston Sabercats vs. Seattle Seawolves at Aveva Stadium | Saturday, April 13 – It’s a grand opening at the newest stadium in Houston, located at Houston Sports Park just off Highway 288 near Pearland. Aveva Stadium looks to be the new home of Major League Rugby’s Houston Sabercats and they christen it with a match against the Seawolves. Tickets range from $55 to $95. 5:30pm. US Men’s Clay Court Championship Singles Final at River Oaks Country Club | Sunday, April 14 – Led by the world’s ninth-ranked player, American John Isner, the 28-player field for the 119th US Men’s Clay Court Championship vies for a $500,000 prize, culminating in Sunday’s Singles Final. Tickets for the Final are in high demand, with Standing Room Only available at $20, but you may find better, cheaper, or hard-to-get seats using the TicketNetwork online marketplace. 2pm. Houston Dash vs. Seattle Reign FC at BBVA Compass Stadium | Sunday, April 14 – The women’s soccer team kicks off their sixth season, led by captain Kealia Ohai, returning defender Ari Romero of Mexico, Canada’s Allysha Chapman, and 2019 SheBelieves Cup winner, England’s Rachel Daly. Tickets range from $7.50 to $25. 5pm. Houston Astros vs. Minnesota Twins at Minute Maid Park | Monday, April 22 – Come through the gates early for this game against the Twins, as the first 10,000 fans receive a George Springer replica orange jersey. Tickets range from $9 to $88, but you may find better or cheaper seats using the TicketNetwork online marketplace. 7:10pm. Sugar Land Skeeters vs. Southern Maryland Blue Crabs at Constellation Field | Thursday, April 25 – The defending Atlantic League of Professional Baseball champions, the Sugar Land Skeeters, return for Opening Day with a special replica championship ring giveaway for fans in attendance. Tickets start at $8 for lawn seating. 7:05pm. Houston Dynamo vs. Columbus Crew SC at BBVA Compass Stadium | Saturday, April 27 – The Dynamo continue their early season with a match against a surging Columbus team that only barely avoided being relocated to Austin in the offseason. Tickets range from $24 to over $60, but you may find better or cheaper seats using the TicketNetwork online marketplace. 7:30pm.